I created a series of fonts for a new type designer a year ago. I also created a Bold version for her basic set as opposed to the larger Pro version. She was learning Fontlab Studio along the way and so I declined to do the Bold version of the large font just because of time restraints. So a few days ago I was sent the new Bold version of the larger Pro font and asked about doing fixes. I agreed and did quite a few. What I'm finding now is that I can't seem to get the bold to work as a family with the Regular version. I've read through and tried every version I could with naming schemes and preference settings. So… my question is: are there any other issues outside of naming that can prevent a weight of a font from becoming a family with another? I should preface that with the fact that I'm not entirely sure of how the original data was pulled into the new Bold version because I know they did copy some bold letters from the Basic Bold that I generated. I ended up having to import kerning data back into the Bold as a result. Have you checked the new font for a trailing space in the name? James, I sent it to my friend Neil and he retyped all the info figuring it would be some space as you mentioned. He got it working we thought. In Font Explorer it started showing up as a family for the first time so I figured the problem was solved and sent her the new font family. Then I found out it's still behaving as separate families in Adobe apps, but works fine in Word. Frank, what is the app you're showing? Sounds like it might be a useful tool. 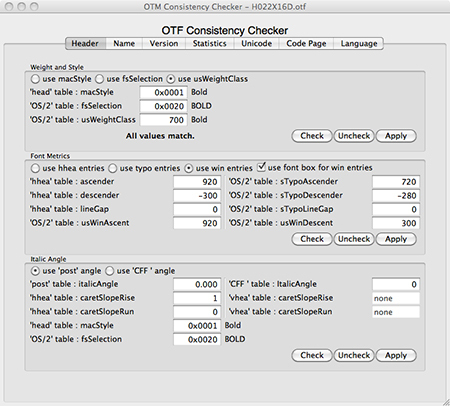 Stephen, the OTF Consistency Checker is part of DTL OTMaster. The manual by Karsten Lücke can be downloaded here as PDF for more detailed info on OTM’s functionality. Thanks Frank. It sounds like a useful addition. Try using the comparefamily tool in AFDKO to compare all of the fonts and look for differences. Also, now that it works for you and Neil, are you sure this isn't a font cache problem on her machine? I checked it out on mine as well. Font Explorer shows them as being in one family, but Adobe apps won't. I think Neil also thought it was working because of what his font manager was showing. I kill caches all the time on my computer. Since they did the build of the Bold I can't be too sure what small things are off. I know they didn't carry over all the kern pairs so I had to fix that. She just sent it off to another type designer she's worked with before so now he gets a turn. Make all the Panose values zero (except the first). They can sometimes screw things up. Font Explorer shows them as being in one family, but Adobe apps won't.